There’s something comfortingly nostalgic about the blue and white tour buses that trundle around the National Mall -- low to the ground, license-plate-free -- every day except the Fourth of July and Christmas. The Tourmobile’s old school-bus-style bench seats, the retro font, and the festive patter of tour narrators as they herald each upcoming attraction call to mind a 1970s-era advertisement for fun-filled family vacations -- as does the proud “on behalf of the National Park Service” announcement at the beginning of each tour. 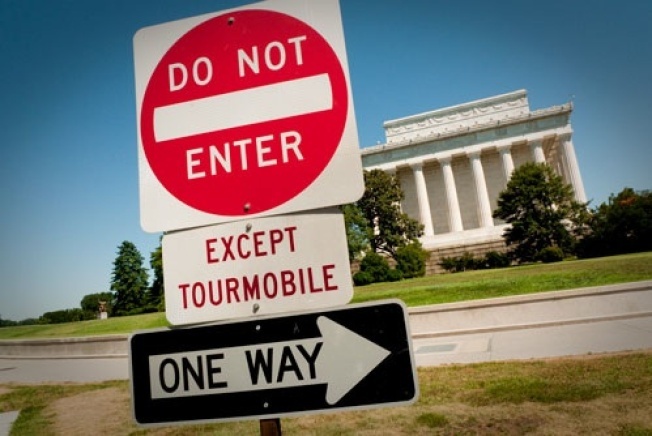 But Tourmobile Sightseeing, which has held the Park Service’s concession for “interpretive transportation” (or, in English, guided tours) on the Mall for more than four decades, has recently made itself into something of a villain. The Park Service’s insistence that the company’s “exclusive” rights preclude any other transportation service has prevented the installation of Capital Bikeshare stations on the Mall and forced the popular, $1-per-ride Circulator bus to detour around it. Meanwhile, the U.S. Park Police has been harassing the pedicabs that haul footsore tourists around; Tourmobile management says the pedicabs also violate the contract. Tourmobile’s determination to keep its monopoly intact may have something to do with a realization that its days of charging $32 a pop for privileged access to prime tour routes are numbered. In 2007, the Park Service did a study that found a strong appetite for cheaper transportation with no narrative soundtrack. And for the last several years, the District has had a plan for the Circulator to do just that. At this point, everybody’s just waiting for Tourmobile to give up the ghost. The thing is, they shouldn’t have to: Nothing in the language of the contract actually precludes the Park Service from allowing different forms of transportation on the Mall, interpretive or otherwise. Tourmobile has the right of first refusal there, but doesn’t get to block others. Besides, Tourmobile’s contract may not even be valid, says attorney Joseph West, who heads the government contracting practice of the white-shoe law firm Gibson Dunn and sits on the board of the National Coalition to Save Our Mall. For the last three years, the contract has been extended without the competitive bidding required by law. Longshore didn’t return repeated calls or emails. Park Service spokesman Bill Line stood by the concessionaire -- and the contract. “Tourmobile continues to provide a valuable interpretive transportation service to the visitors of our national parks under a legally sufficient concession contract,” he said in a statement. Tourmobile didn’t start out as a calcified government monopoly. When the Park Service initially granted the contract to a subsidiary of Universal Studios back in 1968, they had to ward off a lawsuit challenging its right to exist. Trying to protect a few other private carriers in the city, and probably its own bureaucratic turf, the Washington Metropolitan Area Transportation Commission contended any new transportation service should be subject to its approval as well as the Park Service’s. The Supreme Court disagreed, ruling that the secretary of the Interior had sole jurisdiction over the Mall, and Tourmobile started up the next year. The man Universal detailed to run the service, Army veteran Tom Mack, quickly made himself an institution in Washington, joining nonprofit boards and starting an organization that launched early efforts to create a museum of African-American history on the Mall. He bought Tourmobile in 1981, keeping a tidy parking lot operation at Arlington National Cemetery and Reagan National Airport -- and the service thrived with little competition. Sept. 11, however, dealt a huge blow to Mack’s profits; 1.1 million tickets were bought in 2004, compared to two million a year in the 1980s. A few years later, he renegotiated the seven percent of gross receipts he’d always paid to the Park Service down to percent on the first $8 million he made and 35 percent of whatever came after that. As more and more tour services sprouted up, Mack fought vigorously to hang on to his shrinking market share. The Circulator, which downtown business leaders and city officials had envisioned as one way to move tourists around the Mall and the city, was just another threat to Mack’s operation. Mack died in 2009. Management of the company fell to Longshore, who also owns the business that operates the information desk and grave location services at Arlington National Cemetery. Tourmobile’s scores of union workers haven’t gotten a substantial raise in years (drivers with the most seniority top out at $18 an hour) and the manufacturer of their 1970s-era fleet of trams and minibuses went out of business long ago (refurbishing is something of an ad hoc endeavor). Meanwhile, the company hasn’t done much to modernize. You can’t buy a ticket online, and buses still don’t take credit cards on board -- which even pedicabs and food trucks can do. Despite the fact that Tourmobile is the Park Service’s official concessionaire, the average tourist scanning Union Station for a tour service probably wouldn’t find it unless they were looking for it. While competitors enjoy pride of place near the east entrance, Tourmobile’s booth is lost in the middle of the hall and inconspicuously signed, with little in the way of promotional material. The biggest reason you’d take Tourmobile over the other services is trust: It’s sanctioned by the U.S. government, so it can’t be ripping us off, right? The tour itself takes about two hours if you stay for the whole circuit, which would be silly; the point is to get off at museums and memorials and grab the bus again when you want to move along. Sitting there is pleasant enough, although the narrators -- who don’t have to be licensed tour guides, since they don’t get off the bus -- have a troubling tendency to repeat misinformation about the nature of D.C.’s height restrictions. Most customers seem to tune out the Park Service-approved script, absorbed in the scenery, until the narrator tells them to ready their cameras for perfect shots of the Capitol dome or Jefferson Memorial. Why has Tourmobile gotten a free pass for so long? It generates a tidy income for the Park Service -- a total of $1,660,990 between 2004 and 2008, according to the Park Service’s own calculations. Anyone who took over the contract would have to buy all of Tourmobile’s equipment at fair market value, which may deter some would-be operators. Still, despite the financial hurdle, there would be some healthy competition to be Tourmobile’s successor. “I think there’s probably multiple providers interested in bidding on that contract,” said David Snyder, regional manager for the Martz Group, which oversees the red double-decker buses that tour all over the city. “I’m sure we would be. It’s a nice piece of business. It’s very high visibility.” Snyder thinks his company could reduce the ticket price substantially. The entity that would compete most fiercely though, is the District itself. Downtown players including the Trust for the National Mall, the Downtown Business Improvement District, and Destination D.C. are backing DDOT’s bid to potentially both take over the concession for Mall tours, as well as provide a simple transit route through the monumental core. There’s no reason for D.C. vacations to feel like they’re stuck in the ’70s, after all -- nor for it to cost more than $100 for families to get a lift between the National Museum of Natural History and the National Gallery of Art. No reason, that is, except that the Park Service seems to want it that way. Visit the Housing Complex blog every day at washingtoncitypaper.com/blogs/housingcomplex. Got a real-estate tip? Send suggestions to ldepillis@washingtoncitypaper.com. Or call 202-650-6928. The Never Ending Tourmobile was originally published by Washington City Paper on July 28, 2011.